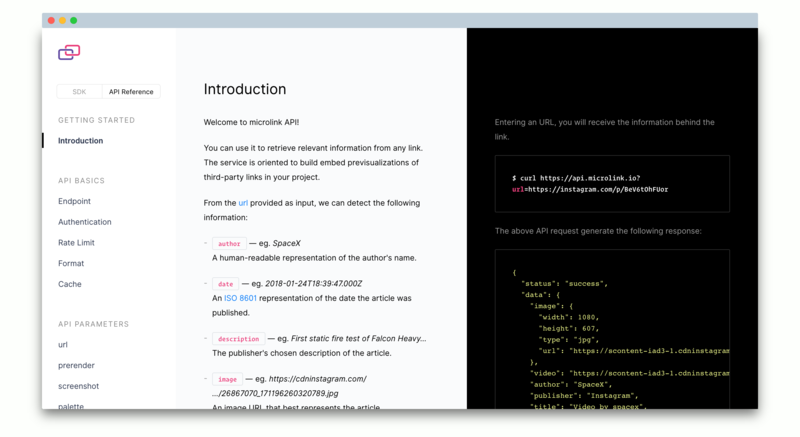 Microlink API examples was improved, highlighting the referenced term in each section. We added a new configurable User Agent as API parameter. Normally you don't need to specify this value but some websites can have a different output based on the incoming request user agent. For example, is very common websites serve images on WebP format they detect that you are using Google Chrome. In the previous Product Brief we introduced the first iteration of video support as part of the API supported data types. Although it is widely used when you consume the API response using our SDK, it can degrade the general user experience, making the response times a bit heavy, specially if you are only interested in the rest of data extracted by the API. We decide leverage the decision in the new video API Parameter, when the default value is `false`. If you are consuming link previews over the SDK, no breaking changes here. Otherwise, keep in mind you need to pass it to have the same effect as until now. metascraper continues to improve, which makes our extraction engine more efficient. Improved URL detection using a WHATWG URL parser. Thanks Stefan Andres Charsley for contribute 🎉. Optimized bootstrap process loadind configuration file just once. Speed up core rules removing non really necessaries steps, also core is smaller and faster right now. Add rules parameter support doing possible load specific rules out of the box. Exported core validators making possible reuse them and creating consistent third party rules set. This changes has been deployed at Microlink API, adding support for a new shiny functionality called Custom Rules: The ability to tell the API new rules to extract new data. We are preparing a new post explaining how to do that, staty stunned 🤘. We started building a gallery of webs, apps or 🦄 who use microlink with some purpose. Please contact with us for add your shiny project there ✨.